Yes, there were actually some books I didn’t enjoy – and didn’t finish. Actually, the books on this list were books I put down for various reasons. So here are the three – yes, three – worst reads of 2018. Those of you loyal readers know I love Beauty and the Beast – I figured reading a story about how the beast came to be would be intriguing, yet was sadly disappointed. This is a Disney produced novel, but they COMPLETELY CHANGED THE STORY. Why are you going to write a backstory to one of your classic movies, but completely change the story of how the beast came to be? Trust me, I get retellings, but don’t use the Disney image of Beast and the do a 180 on the backstory, because it doesn’t fit the story Disney gave us. It really doesn’t fit the original fairytale version. I was sooooo excited to pick up this book. A book about weddings? Yes, please! Drew is in town to be the best man in his friend’s wedding to he ex-girlfriend – awkward. Drew meets Alexa in his hotel elevator – a meet-cute? Yes, please! Drew then invites Alexa to be his fake-girlfriend to get him through the awkward wedding. It was cute and then the weding was over before the the book was a quarter of the way through. The spark disappeared and the relationship hit overdrive in an unrealistic way. The character’s chemistry felt rushed and the relationship wasn’t anything more than uninteresting puppy love. I had high hopes for this book, but was disappointed with the execution. The news that this would be a movie in 2019 intrigued me to pick it up. Must be good if it’s getting a movie deal right? I can’t believe I wasted money on this book (luckliy only on Kindle, so it was cheaper than a physical copy, but STILL). I ended up not finishing 15% of the way through the book because the main character, Hardin, was creepy and mentally abusive – and that was only 15% into the book. From reviews I read to see if it got better, it didn’t. This twisted “One Direction Fan Fiction” somehow became popular on Wattpad, and then became a bestseller – kinda the same way the Fifty Shades of Grey series became a bestseller. It makes me nauseous to know that young girls will read this book or see this movie and think this is how guys should treat them. There is much better literature out there that has tasteful romance/sexiness without the guy being mentally and emotionally abusive to the girl. So thanks, but no thanks. That’s all for now, what were your worst reads of 2018? Ready Player One is literally one of my favorite reads this year! The book is set in the future, 2044, which isn’t too far from now. However, the entire book revolves around all things 80s – as in 1980s – while integrating into the virtual world of OASIS where one can literally do anything your heart desires: play games, eat, watch movies, battle other players, research things, create your dream lifestyle, and even do hanky-panky type things with other players. OASIS is a world where you could completely recreate yourself and your lifestyle – which is what main character, Wade Watts does. OASIS was created by a guy named Halliday, and after he passes away, a video announcement goes out explaining an intricate competition that will lead to one person becoming the owner of the OASIS and Halliday’s vast fortune. There are no hints, just the challenge. Wade, along with a colorful cast of characters, take readers on an amazing adventure through a virtual universe to save the OASIS from being taken over by a big-time corporation, IOI, who has an army of players (the Sixers) constantly on the hunt for hints and hidden eggs in Halliday’s challenge. Ernest Cline did a wonderful job creating a world that every reader would want to jump right into. He also did a great job of showing the potential negative long term effects of technological advances on society. This movie isn’t just fun, it makes you think and reflect on how technology is great and can be helpful, but going out and seeing the world – and interacting with physical people – can be just as great. In terms of the movie, I loved it as well! My fiancé hadn’t read the book, but wanted to see the movie – of course the video game geek wanted to see the movie. He LOVED it. While the movie had things that weren’t in the book or were different from the book, they weren’t bad changes. The differences were seamless and overall story was the same. I’m usually a firm believer in the book always being better than the movie, but in this instance they are both amazing. If you enjoy sci-fi, virtual worlds, videogames, the 80s, or adventures, this book is for you! Literally the synopsis from Goodreads is all you need to make up your mind about this book! I was hooked from the beginning. I had seen the movie before reading the book. I loved the movie, but was skeptical to picking up the book because I wasn’t sure if they had made the movie funnier or if the lightheartedness of the movie would be the same in the book. I was so wrong to be skeptical! Despite the book depicting a controversial time in American history, Stockett created the same kind-hearted, realistic story for all to enjoy. It’s no wonder that it is a NYTimes Bestseller! One thing I liked most about the book was that it didn’t solely focus on Skeeter and her journey to expose how black maids were treated by white families. We were also introduced to two of the maids featured in Skeeter’s book – Aibileen and Minny. The weaving of all three stories and point of views was seamless. I never felt confused or had to back track and I genuinely cared about the characters. This is also the first historical fiction I have ever read and I can say that I really enjoyed it. I hope to add it to my genres in the future! If you’re looking for a book to read on a long flight, this is definitely the one for you! I’m not going to review Stardust by Neil Gaiman or Memoirs of a Teenage Amnesiac by Gabrielle Zevin, because I honestly did not like either of them enough to put anything into words for a post. However, or my next post I’m diving into Divergent by Veronica Roth! Happy reading bookworms! It was a long week of ugly, cold, rainy weather here in Vacaville, California. Besides binge watching The Secret Life of the American Teenager on Netflix, I also rented 12 movies and was the third wheel for my boyfriend and his cousin to the movies. I thought I would write a review of all the movies from this crazy week/weekend! Ya’ll already know how I feel about this one, given I reviewed it when it came out. I only rented it because my mom hadn’t seen it yet. Good movie to watch just because it was raining; still not better than the first. I LOVE ADAM SANDLER MOVIES. Seriously one of my guilty pleasures! This movie was equally corny and nerdy, and it was perfect for a rainy day in. It’s not Oscar-worthy, but the thing with Adam Sandler movies is that they are feel-good movies and this movie is no different. 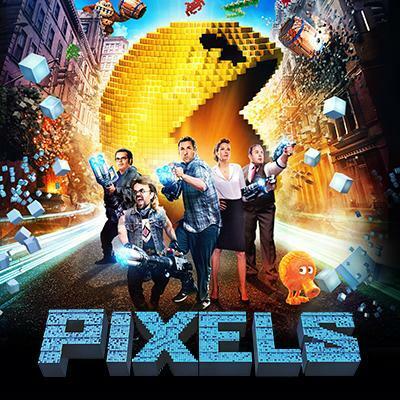 The movie features favorite classic arcade games and actors Adam Sandler, Kevin James, and Josh Gad. 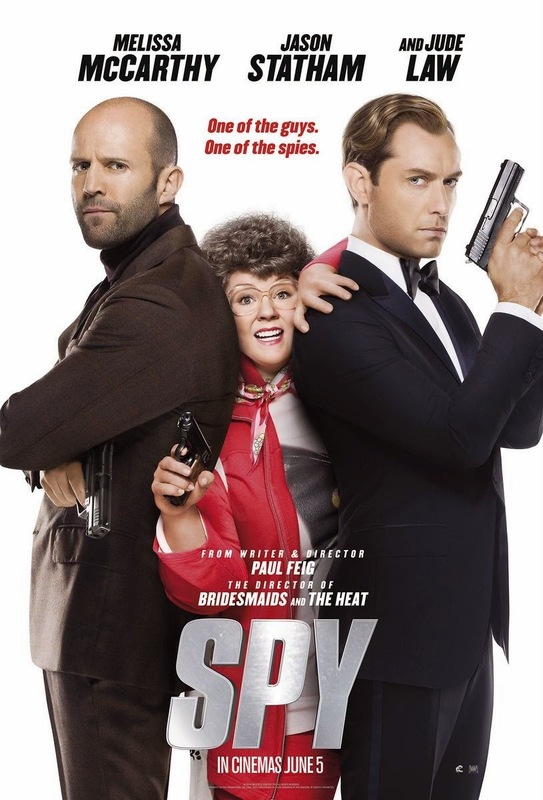 I love Melissa McCarthy; I love Jude Law; heck, I even like Jason Statham, even if he is my boyfriend’s boyfriend; but not in this movie. It was slightly funny in the beginning, but we ended up turning the movie off at the part where she was in Italy because we were bored and on our phones. I expected this movie to be funnier and it was kind of a let down. Maybe McCarthy will be better in the new Ghostbusters movie, and Law and Statham can return to their usual movie genres. Now this wasn’t disappointing. It followed the book closely and was quite enjoyable. However, I didn’t like the casting of Cara Delevingne as Margo. I feel as though Delevingne was a random hit into left field that no one was expecting. She just isn’t what I pictured as Margo given that she was described as this beautiful girl that everyone loved but was mysterious. In all honesty, I don’t think Delevingne is that pretty. This may be against popular opinion, but it’s what I believe. I pictured a few people playing the character of Margo including Hailee Steinfeld, Lily Collins, AnnaSophia Robb, or Chloe Grace Moretz. Surprise! I’m also a National Lampoon fan! And for those of you who haven’t seen it, this movie did not disappoint! It was laugh-out-loud funny. The two kids, James Griswald played by Skyler Gisondo and Kevin Griswald played by Steele Stebbins, reminded me of me and my little sister when we were younger and on road trips. If you’re in the mood for a good comedy, check this one out! You even get to see Chris Hemsworth, and if that doesn’t sell you on it, I don’t know what will! Chris Pratt. That is all. Just kidding. This movie was really good. It was a roller coaster of emotions throughout the entire film and I enjoyed it. I applaud Bryce Dallas Howard, who played main character, Claire, for running in heels for the entire movie. It is a little shocking that the entire movie takes place over the course of ONE day at the island Jurassic World is on. The dinosaurs are scary. I also don’t understand how these people ran for the entire movie – I definitely would have died from an asthma attack or the Pterodactyl thing would have eaten me. Overall, it was definitely a great movie and has made me want to watch the entire franchise from beginning to end. Let’s be honest, I watched the first five minutes and then fast forwarded to all dance/strip scenes, because that was the only part worth watching. Also, I watched those scenes with my giggly mother, so it was aca-awkward. But boy, are those men hot and they know how to strip. Thank you Channing Tatum for making a sequel! Warning: I have never seen any Star Wars movies prior to me seeing this film. My boyfriend is a Star Wars nerd and growing up with the pop culture we have, it’s easy to know the general idea of the franchise or even know what the iconic things are. With this is in mind, it was a really good movie in terms of special effects, costumes, sets, acting, etc. But to someone who only knows the pop culture references and iconic props/lines, it was a little predictable. Proceeding with SPOILERS. The main character, Rey, looks like she could be related to either Luke or Leia, and 3/4 the way through the movie Luke’s lightsaber calls to her. Hans Solo also dies at the hands of his son, Kylo Ren, which I TOTALLY PREDICTED, but my boyfriend said I didn’t understand the significance, blah, blah, blah. Like I said, it was a good movie, just predictable. The Pixar movie where our feelings have feelings! I originally saw this movie with my gymnastics camp kids over summer, then I just recently re-watched it with my boyfriend’s nephews and niece. I’ve seen all of the Mission Impossible movies. They improved with each one over the years, but I really thought that Ghost Protocol was going to be the last one. Rouge Nation was okay. It started right away with action, but slowly became boring about half way through the movie. Apparently there will be another Mission Impossible, and I must say, Mission Impossible has run it’s course. I had high hopes for this film due to the star-studded cast, but it was a major flop for me. I’m not sure if it was the DVD I had, but the sound quality was so poor, our TV was turned all the way up, and I still felt like I couldn’t hear what they were saying in the movie. The movie itself was kind of boring. Right away we’re thrown into the story and I wasn’t quite sure what was going on or why Bradley Cooper’s character was now in Hawaii, since it was stated in the beginning, but very vaguely. I’m not going to lie, but I definitely fell asleep during the movie and only woke up when it was finally time to put in a new movie. My boyfriend and I have been trying to catch this movie for a while now. When we finally got it recorded at his house, his DVR stopped working, so I finally just rented it. This was definitely one of the best movies I’ve seen in a really long time. 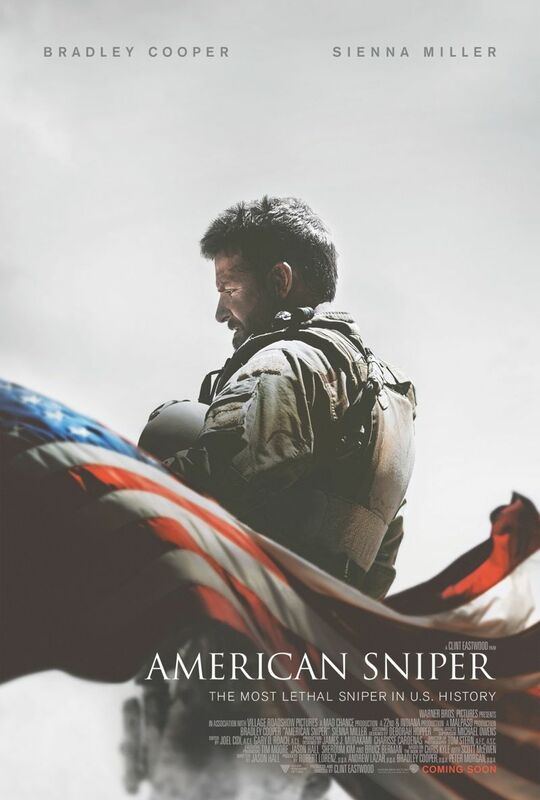 Clint Eastwood directed a beautiful masterpiece that depicted the life of American hero and legendary sniper, Chris Kyle. Bradley Cooper did an amazing job portraying our fallen hero. It’s a terrible thing that happened to Chris Kyle in the end, but his legacy will live on through his autobiography (which I hope to read this coming year!) and this movie. This is the type of movie that makes me proud to be an American. I salute you Chris Kyle and all those who have fallen for this country. I’ve heard nothing about this movie anywhere and deserves more credit than what it’s been given. It’s a twist/prequel of our beloved Peter Pan story and how he and the lost boys arrived at Neverland. The “evil” character is Captain Blackbeard played by Hugh Jackman (swoon) who kidnaps orphaned boys and brings them back to Neverland to mine for pixie dust to he can live forever. 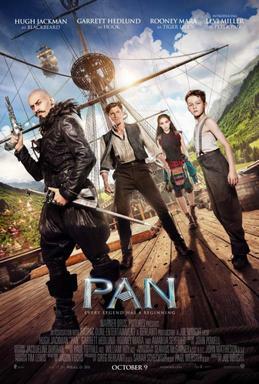 Pan and an unlikely alliance, James Hook, fight their way through Neverland to learn the truth about the island, Peter’s mysterious past, and how to defeat Captain Blackbeard. The movie’s whimsical vibe created an atmosphere of adventure; kind of like the ones we would day dream about as a child. The movie also reminded me of the movie, Stardust, based on Neil Gaiman’s novel of the same name, because of it’s whimsical and adventurous nature; which also made me enjoy the movie that much more. I think what really put me over the top, was when the lost boys were singing choruses from Nirvana and The Ramones. It took me a second to think about what they were singing, and I literally looked at my mom and was like “Are they singing the chorus from ‘Smells Like Teen Spirit’ by Nirvana?” She thought I was hearing things, and then the next scene they were singing “Blitzkrieg Bop” by the Ramones, and she looked at me and said, “Yeah, they’re singing Nirvana and The Ramones alright…” Overall, I thought this was a really good, whimsical twist on one of my favorite tales. Well, there is my review of my very long movie marathon. Hope you all had a wonderful holiday! Look for my post about Never Never part 2 by Colleen Hoover and Tarryn Fisher as well as my yearly wrap up! Happy reading lovlies!